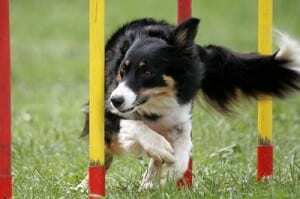 Anyone who has seen an agility competition can feel awe at the talented dogs scaling ladders, running through tunnels, and balancing on teeter boards. Agility is a great sport that strengthens the bond between dog and human, and it poses a healthy challenge for the dog. If you want to try with your dog, you can do so at home. You can make your own obstacle course, and once you have that, it just takes some patience and training. A basic agility course has weave poles, a dog walk, standard jumps, a pause table, a tunnel, and a tire jump. All these things are for sale, but you can also make them yourself with materials from a hardware store or a flea market. You can make your own weave poles through sticking PVC pipe into the ground. Make sure there’s enough space between the poles for your dog to navigate around them. Bamboo poles also work very well. The dog walk is basically a long bench where the challenge for the dog is staying on the bench instead of jumping down. You can use a picnic bench, or make a dog walk by placing a piece of plywood across cinderblocks. For pause table you can use an old coffee table. Just make sure that it’s stable and not too high off the ground. When it comes to jumps, make sure they’re low enough for your dog to be able to get over. You can increase the height as your dog gets in shape and figures out what to do. Many build jumps out of PVC pipes, but you can also balance a broom stick on two flower pots. For a tire jump you can use a hula hoop tied sideways between two chairs. Just make sure the construction is stable enough not to fall when the dog jumps through. Most department stores and children’s stores have collapsible tunnels. One of these won’t last as long as a specially made agility tunnel, but it’s a good start that will last long enough for you to figure out if this is the right thing for you and your dog. You can also make your own tunnel with a row of low tables and blankets. Before starting on the course, make sure your dog knows basic commands such as sit, come, stay, and lie down. Once you have that down, help your dog through the course. Take your time and start slow.